Amazon held its second annual Picking Challenge last week, in conjunction with Robocup 2016 in Leipzig, Germany from June 30 to July 3. A robotic arm, designed by a team of engineers from Delft Robotics and TU Delft Robotics Institute, took home the $50,000 grand prize. The robotics competition is designed to address the challenge of commercially viable automated picking in unstructured environments (or—as humans might call them—human environments). For example, finding seven specific items of merchandise on Amazon’s hundreds of shelves. The competition’s stated goal is to “strengthen the ties between the industrial and academic robotic communities and promote shared and open solutions to some of the big problems in unstructured automation,” per the Amazon Picking Challenge website. 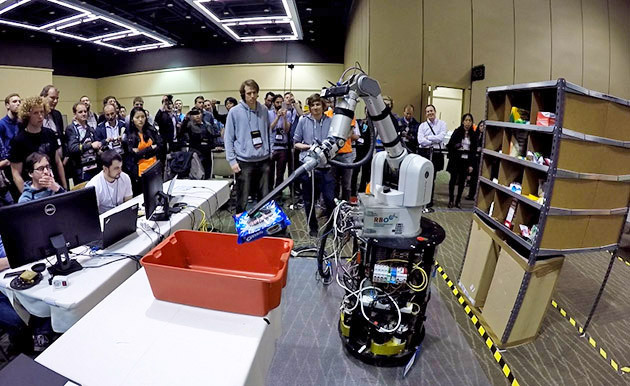 A robotic arm is shown picking and stowing a pack of Oreos at last year’s competition in Seattle. Competition on the first day was fierce, with some excellent performances. First place was won by team Delft who stowed 11 items into densely packed bins to earn 214 points. NimbRo Picking placed second and MIT took third place. This year’s picking task was significantly more difficult than the 2015 task, with denser bins, occluded items, and products that are more difficult to see and grasp. The teams rose to the challenge and demonstrated much more sophisticated perception and manipulation solutions. The competition was so close that the judges had to resort to the second tie-breaker using video replay to determine the winner. Both Team Delft and PFN finished with 105 points, but Delft achieved their first pick in a mere 30 seconds, beating PFN’s 1:07 time. For a video of the competition, make sure you follow the link in this week’s Direct and Current e-Newsletter!